The table shows total revenue created by complementary medicine over three years. The two charts illustrate the number of hospitals offering complementary medicine over twenty five years with a further classification showing which kinds of medicine proved the most popular in 2012. The table lists total revenue from complementary medicine in the U.S. in billions of dollars over three years. 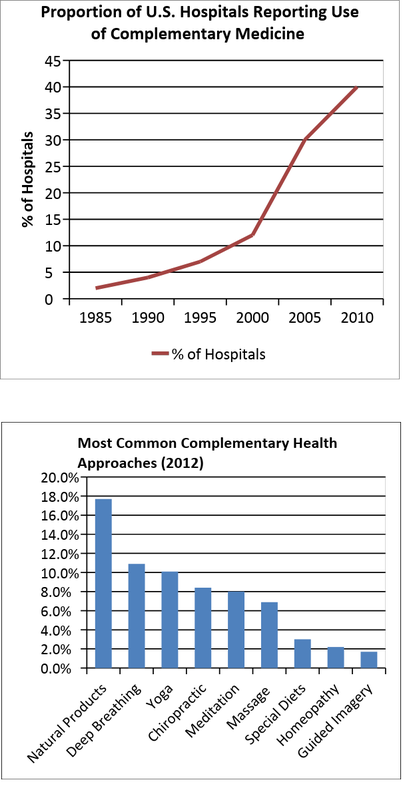 Of the two charts, the first illustrates the percentage of hospitals in America that used this health approach between 1985 and 2010, while the second depicts the top ten types of complementary medicine preferred by Americans in 2012. Overall, revenue from nonconventional medicine rose as its use became more widespread. In general, most Americans chose natural products over other kinds of complementary healing techniques. The table clearly shows an increase in money earned from alternative medicine of $3 billion from 2011 to 2016. Other data appears to support this. The percentage of hospitals offering this kind of healthcare approach increased steadily from 2% in 1985 to around 12% fifteen years later, then in 2000 jumped substantially to 40% by 2010, an increase of 30%. Of the health approaches offered in 2012, around 1 in 5 US citizens preferred natural products to other options, almost double the number of the next two popular choices: deep breathing and Yoga. Around 8% underwent chiropractic, meditation and massage for each, while the final three techniques collectively remained unpopular at under 3%. Describe the table first followed by the two charts. When listing the two charts, state “of the two” in order to introduce them and make it clear to the reader in the subsequent sentences which one you’re talking about. ”Data is from 1985 to 2010 so remember to use past tense later paragraphs. The table clearly shows an increase in revenue from complementary medicine; a factor that most likely has led to the increase in hospitals offering these treatments. More mainstream complementary therapies were also the most popular with Americans in 2012, especially natural products. Begin by describing the table. The second sentence shows its relationship to the chart describing revenue to hospitals that has been earned from CAM. It’s important not to state the line graph supports the table since the writer should only interpret the data not analyze it. Use tentative language in your description. Include an adjective or adverb with every noun or verb to describe more accurately. Use suitable line graph vocabulary to describe the number of hospitals using CAM. Compare the top choice of natural products to the next two by grouping them (since their numbers are approximately equal). Use “for each” with chiropractic, meditation and massage to show that each one had the same figure. Use collectively with “the final three techniques” to show that they can be counted together. The table list total revenue from complementary medicine in U.S. in billion of dollars over three year. Of the two chart, first illustrates the percentage of hospitals in America that use this health approach between 1985 and 2010. While the second depicted the top ten types of complementary medicines preferred by Americans in 2012. Overall, revenue from nonconventional medicine rose as its use became more widespread. In general most American choose natural products over other kind of complementary healing technique. The table clearly shows increase in money earned from alternative medicine of $3 billion from 2011 to 2016. Other data appear to support this. The percentage of hospitals offer this kind of healthcare approach increase steadily from 2% in 1985 to around 12% fifteen years later Then in 2000 jumped substantially to 40% by 2010 an increase of 30%. Of the health approaches offered in 2012 around 1 in 5 US citizen prefers natural product to other options, almost double the number of the next two popular choices: deep breathing and Yoga. Around 8% undergo chiropractic, meditations and massage for each, while the final three techniques collectively remained unpopular at under 3%. Look at the table first. How does revenue increase in the table? What is the general trend given in the line graph? Do you see any relationship between the two? The table and graph can be grouped together into the first body paragraph. Now, consider the bar chart. Which approach was the most popular? Which therapies have similar results and can be collected together?